As China's megalopolises briskly internationalize, the Hudson family is doing their part to make the tiny hamlet of Chaolong in remote Guangxi a global village, too. British and Swiss couple Michael and Nadine Hudson and their kids - Desmond, 8, and Lenny, 12 - manage the Outside Inn holiday retreat and relish a rustic village life unimaginable to most China expats. "We love being away from the busy town, the friendly village locals and keeping in touch with nature," Michael says. For Nadine, the simplicity of life makes Chaolong wonderful. "Living without distractions makes me see what's really important to me," she says. That doesn't mean they're not busy. They liken running Outside Inn - an abandoned village leased and renovated into a holiday retreat by Dutchman Herbert Bloembergen - to acrobatic plate spinning. But it's a dream job come true for the veteran globetrotters. "It's a bit like traveling the world without leaving the doorstep," Nadine says. "We meet people from all different backgrounds, different employments and different cultures, and talking to so many different people gives us a great glimpse into different worlds." At the same time, they try to share their passion for Chinese village life with guests. "When they leave with a smile after a few amazing days in rural China, we feel we have achieved something," Nadine says. The couple, who met while touring India, had spent years backpacking the world, supporting their journeys through travel writing. In 2006, they gave up everything they had in Switzerland for a new life in Chaolong. They agree it was the right decision, especially for the boys. "At home I could only go out when somebody was watching, and I always had to be careful of traffic and other hazards," Desmond says. "There was noise and everything was gray. Now, I can spend all day outside and don't need to worry about anything." Their children have plenty of playmates, both village kids and children staying at the retreat with their parents. "I always like to show new friends how I can catch fireflies, how many I can hold in my hand and how they blink when they are on me," Lenny says. 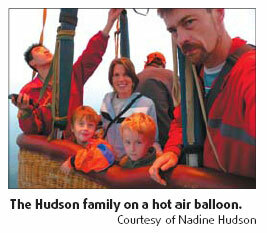 The family often goes bicycling, hot air ballooning, hiking and swimming in the rivers. But while living in Chaolong is generally idyllic, the foreign family says fitting into rural Chinese life is sometimes tricky. Nadine and Michael home school their sons, because the local school's class hours are long and the boys don't speak enough Chinese. The language barrier and different ways of playing also makes it difficult for the boys to keep friendships. "Two foreign children are kind of a great attraction but not necessarily the No 1 choice of a playmate," Nadine says. It's similar at the adult level, she explains. "The biggest challenge is not always understanding why people do things the way they do, due to language barriers, superstition, village issues and cultural differences," Nadine says. Michael says it's often difficult to find supplies for the resort in such a rural area. But the Hudsons insist it's well worth any hardship. "China and its people are amazing," Nadine says. "We are grateful to be allowed to live here and have this experience. It's once-in-a-lifetime."